Corporate Governance | APAMAN　Co., Ltd. The basic idea of ​​our company's corporate governance is as follows. Under the holding company structure, the Company, the parent company, supervises and manages the corporate group consisting of 20 companies that develop core businesses such as intermediary business and property management, PI · fund business and other businesses, We will fulfill corporate responsibility (CSR) for all our stakeholders including society and our shareholders, and we will further exploit the synergies between our company groups. We regard these as one of the most important tasks of our management activities. In addition, by clarifying the responsibilities and powers of each business through the holding company structure, by realizing flexible group management and strengthening market competitiveness as a basic code of conduct, it is possible for companies We aim to further improve the value. 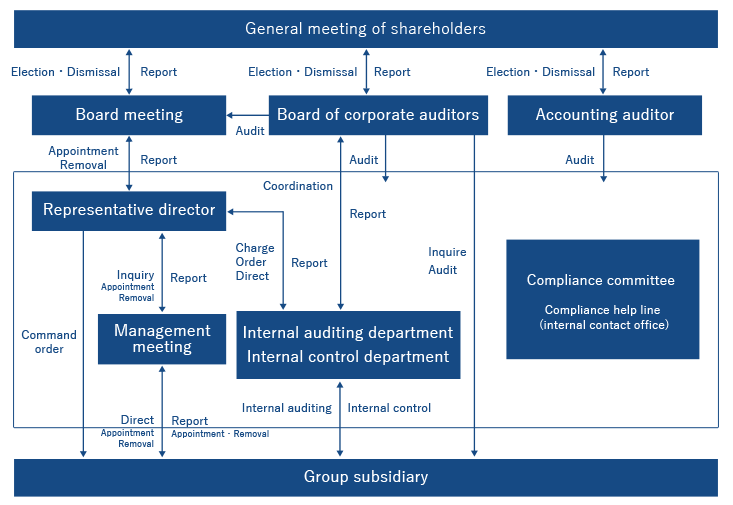 In principle, our corporate governance system is based on the assumption that the representative director of the Company and the executive director concurrently serve as representative directors, directors, and corporate auditors of the group companies, and the business strategy formulation including the group subsidiaries, We are doing the best allocation. The supervisory body of our management team is a management meeting with the main objective of preliminary deliberation, information sharing and examination of risk information on important management matters with the Board of Directors and the Board of Corporate Auditors (including outside corporate auditors). In addition, as a supervisory body of the business division in which each director performs business operations, the internal audit department responsible for business audits etc., related laws related to the Company and its group subsidiaries (such as the Building Land and Building Transaction Business Act, Construction Business Act, etc.) The Compliance Committee aims at compliance and management of regulations based on the Law and Personal Information Protection Law, etc.